Creating a contemporary bathroom with a genuine wow factor can be a hard thing to achieve although there is one area which can totally transform the appearance of the setting leaving you with a beautiful focal point; a modern freestanding bath. There are numerous designs and materials available to choose from. This guide to buying modern freestanding baths will detail exactly what's out there and why specific baths should be taken into consideration if you want the ultimate effect. 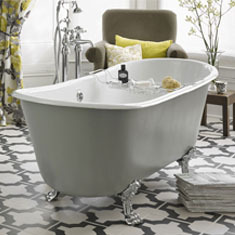 Most modern freestanding baths are made using a tough, durable twin skinned acrylic. There is a wide variety of shapes and sizes so we've outlined the differences between them, allowing you to make a more educated purchase that will really work with your particular bathroom. Double ended baths: These large, luxurious freestanding baths are ideal for those wanting to make a real statement with their contemporary bathroom. 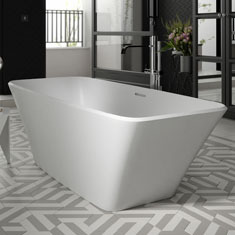 There are plenty of choices including curvaceous baths, rectangular designs and even more uniquely shaped versions for a real designer touch. With these luxury modern baths, taps are usually placed in the centre so that there is space either side for two people to relax without someone getting the dreaded 'tap end'. Single ended baths: You'll always require a generously-sized bathroom for a freestanding bath but if you're working with a smaller space then a single ended bath will be the best option. This is down to the fact that they feature all the contemporary style of double ended baths without taking up as much space. These items feature a sloped end with taps situated at the other, so they're generally not designed for two people to share. Slipper baths: Slipper baths feature a sloped end, or ends, which are more steeply raised than regular baths, enabling you to sink further inside for a more thorough, relaxing soak. They also have the added bonus of looking super-stylish and chic, fitting nicely into most bathrooms as they are usually built with a compact in design. Which taps do you need for a modern freestanding bath? Selecting the right set of taps for modern freestanding baths will add an extra element of style into mix, finishing things off nicely. Here are some of your choices. Freestanding taps: These taps are mounted away from the bath itself but close enough to it so that they allow water to flow into the tub without splashing everywhere in the process. They are great if you don't want to drill holes into the bath itself, or where there isn't an opportunity to do so. They look extremely classy, and will really complement a modern setting. Wall mounted taps: Attached to the wall above the tub, these taps are great if you don't have any tap holes. They also hide pipework from view, giving the area a much more flush, tailored appearance. Deck mounted taps: The standard way to install taps is to simply mount them to the bathtub itself. These items are practical and with countless style choices to peruse, finding some that work with your particular bath should be a doddle. 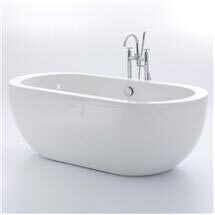 Wastes are essential aspects of any bathtub whether it's modern or traditional. When it comes to modern freestanding baths there are plenty of options to choose from including pop-up and click clack wastes. These two are most commonly found on our website as they normally feature very sleek, minimalist designs which complement contemporary fixtures perfectly. 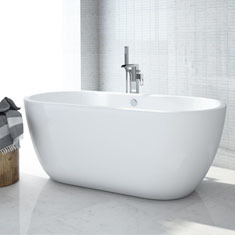 Some modern freestanding bathtubs are actually raised off the ground. Some feature a subtle twist on the vintage styling of traditional feet, while others feature stunning wooden plinths which sit under the bath, giving off a unique, personalised vibe. There is no right or wrong with freestanding bath feet and it depends on the design and style of each individuals bathroom.